Hydrogen fueled cars are the next big thing in the automotive industry. Due to increased pollution through carbon emission and soaring petroleum prices, as well as the fear of extinct fuel reserves, oil and energy giants have been pressured to come up with alternative energy sources. The automotive industry, being the greatest consumer of fuel, has also had to conform to the new status quo hence the emergence of electric powered engines. Electric engines are run using battery cells. Hydrogen gas as a fuel source has become revolutionary because it is available in abundance. 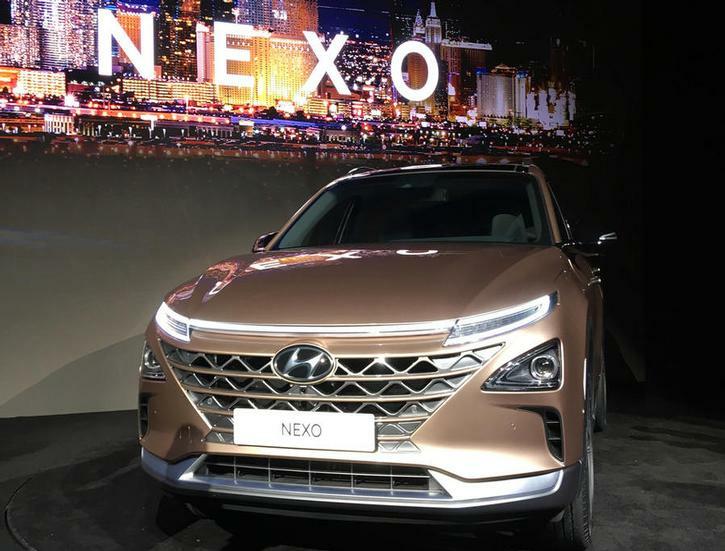 Currently, there exist only four cars that use the hydrogen fuel cell technology; Toyota Mirai, Hyundai ix35 FCEV, Honda Clarity and now the Hyundai Nexo. Hydrogen gas is combined with oxygen producing electricity essential for powering the electric motor used in the vehicles. The Hyundai Nexo is Hyundai’s 2018 release. One of its destinations release markets is the Australian market especially the outback. Hyundai has its head office in Sydney encompassing the only hydrogen fueling point. Nexo is unequivocally the latest pinnacle in the hydrogen fuel cell technology and definitely gives Tesla a run for its money. First of all, it’s an SUV, and a quick glance at its exterior sends exiting chills down your spine. It has a futuristic and modern vibe especially from the front view; the horizon positioning lamps are not of this world. The back is equipped with a D-pillar air curtain which maximizes aerodynamic efficiency. As you approach the vehicle, theauto flush door handlesextend from their retracted position to enable you to open the door. As you get in, you are surrounded by an exquisite interior which includes a 12.3-inch screen on the center console and an extra one on the driver’s dash console. Driving is no longer the primitive gear lever and pedal experience. The car is equipped with different Advance Drive Assistance Systems (ADAS) such as Lane Following Assist to enable one stick to the lane just in case they take their eyes off the road for a second. Highway Driving Assist uses sensors in front of the vehicle and a camera at the mid-top of the front windshield. It helps the driver keep a safe distance with the car in front of them. The Blind-spot View Monitor assists the driver change lanes on the highway without the hustle of having to peep through the rear mirror or side mirror. You get a full rear view on the driver's console screen when the turn signal is enabled. The icing on the cake would be the Remote Smart Parking Assist which enables the car park on its own. Other specs for the Hyundai Nexo is that its refueling time just takes five minutes, and that would take you 800 kilometers; even better than the conventional gasoline or diesel vehicles. Zero emission is its policy as water is discharged. Nexo’s air filter, humidifier, and fuel cell stack used for power generation double up as an air purification system. Nexo production is also planning to have the car serve as a mobile energy station providing power to a camper in their trailer. The first consignment is expected to hit the Australian market in late 2018 or early 2019. Unlike its predecessor - Hyundai ix35, the Hyundai Nexo will be available in right-hand drive.